Married to beautiful wife, father of 4 children, avid runner, occasional trumpet and drum player, alumni of Up with People C 96, hockey coach, public speaker, and a teacher of all things. With that being said, when do I possibly have time to run? Toss in a full time job that I truly enjoy and some business consulting on the side, sleep becomes a challenge. I ran in high school, but was never fast. Cross country running, track, tennis … I was active. In 2007 I registered for the Denver Half Marathon. Not a lot of training later and I showed up on race day quite nervous. The week before was the now infamous Chicago Marathon where people were dropping like flies due to the heat. Now it was race day and it was 40 degrees with a hint of rain. Nonetheless, I finished! The following 2 years included another half dozen marathons and changing my perspective on what I can actually do. Again, not how fast, but how far. 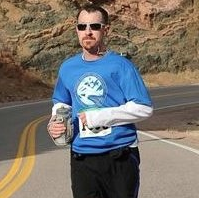 2009 I completed the Colorado Marathon. Wow! Slow as hell, but still 26.2 miles on my feet. No coach, no solid training plan, and no true idea of what I was doing. Just moving forward. In the 2 years that followed I ran another 6 marathons, sometimes back-to-back weekends, and started to get complacent with 26.2 miles. Then I discovered the world of ultramarathons! By this time I had started surrounding myself with runners. Twitter was a great help in finding resources on training, nutrition, and learning from other athletes. That’s when I found Leadville, Colorado. At 10,000 feet above sea level, it is a place that hosts some of the toughest physical events out there. In April of 2011, I registered for the Silver Rush 50. That’s 50 miles of trail starting at 10,000 feet and going up to 12,000 feet 4 times. No small task. My wife was my crew and got to experience a race for the first time. She wasn’t sitting in the front row, she was on the field. A fast learner and someone that understands my personality, it made the event all the more better. Crossing that finish line was a huge accomplishment! I still don’t think I fully understand what I did that day. Now I spend my time with family, working, running, and promoting active living. You don’t have to run to be healthy, but you do have to move. I continue running several marathon and ultramarathons each year while coaching and encouraging others to do the same. 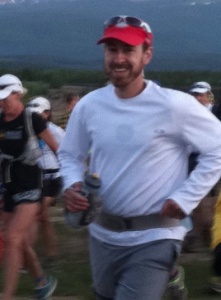 In 2012, I completed the Silver Rush 50 again and took my first attempt at the legendary Leadville 100 Mile Run. I made it to mile 52 after the cutoff time so wasn’t allowed to continue, but the experience has fueled my drive to go farther. Not finishing the Leadville 100 has allowed me to find my line of possibility … so now I have a target to move that line! Along the way I raised thousands of dollars for the American Cancer Society. I will continue running for this great organization working to find a cure for cancer that surrounds us all. If you know of any company that would be interested in contributing, send them my way! I will speak, write, and fund raise my heart out for a worthy cause! This site is the place I write my thoughts as it relates to running, family, and work. Running is not a one time activity … it is a way of moving forward.